How Will It Influence You? Every movement of Jupiter is a time when you can seek and obtain the maximum benefits from Jupiter. It is very helpful to acquire Jupiter’s assistance in overriding the negative afflictions you have from any other planet. But, if Jupiter is unfavorably placed in your birth chart, i.e. when he cannot protect you, you are more prone to inner fears, distractions from others who could harm your reputation, and loss of opportunities for wealth. In some cases, without proper awareness and prevention, long-term problems could be created, which require much time and energy to reverse. Jupiter goes direct in Leo on May 9th IST. Participating in the well-timed rituals for Jupiter will help you connect with the Guru, the remover of ignorance and the bestower of growth, optimism, joy, and abundance. When you are connected to Jupiter, he helps you rise above a situation and gain a bird’s eye view and consequently higher knowledge to improve a situation. Jupiter helps you aspire for things that you thought to be beyond your boundaries of imagination. He will also facilitate better development of the sixth sense – good intuition power. His blessings will prevent or lessen the harmful effects that are coming your way. Jupiter, which was erstwhile in retrograde motion in the sign Leo, will start its direct motion in the same sign, in the star Purvaphalguni. Leo is ruled by the Sun, who will be exalted in Aries, adding more strength to the planet Jupiter. Jupiter in Leo will be along with Rahu and will be moving closer to him degree-wise. This will bring mixed results. Change and transformation in personal and mental outlooks will help make good use of new opportunities. Starting anything new will turn out to be auspicious. Jupiter is comfortable in direct motion; hence he will start showering his benevolence in all walks of life. Now is the right time to propitiate Lord Jupiter to fulfill your dreams and aspirations towards abundance. Worshipping Lord Dakshinamurthy, one of the forms of Lord Shiva, will help you gain access to the knowledge that is required for you to plan your success path. 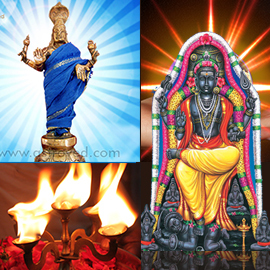 Dakshinamurthy is hailed as the Guru of the Guru, meaning the preceptor (Guru) of Jupiter (Guru). In other words, Jupiter is an extension of Lord Dakshinamurthy, and sincere prayers to them will enhance knowledge and prosperity. As the planet Jupiter is closely moving towards Rahu, it is also necessary to propitiate the planet Rahu for auspicious results. Participate in the essential Jupiter Direct in Leo rituals. Dakshinamurthy, a form of Shiva that is a Guru, is the God of education and knowledge who will shower his positive energy on you to achieve success. He is depicted as teaching in silence, transmitting higher knowledge effortlessly to four ancient sages, who were receptive to the inner transference of wisdom. An archana (light and sound ritual) will be performed to Dakshinamurthy and Rahu at their powerspot on May 9th (IST). You will receive Vibhuti and kum-kum (Red Vermillion Powder), which will be blessed in the rituals. Keep this on your meditation altar and wear it on your forehead during meditation or at other times to expand the Divine blessings into your life. Participate in the enhanced Jupiter Direct in Leo rituals. Dakshinamurthy, a form of Shiva that is a Guru, is the God of education and knowledge who will shower his positive energy on you to achieve success. He is depicted as teaching in silence, transmitting higher knowledge effortlessly to four ancient sages, who were receptive to the inner transference of wisdom. An archana and a group homa will be performed to Dakshinamurthy on May 9th (IST). As the planet Jupiter is closely moving towards Rahu, it is also necessary to propitiate the planet Rahu for auspicious results. 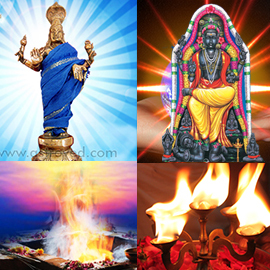 An archana (light and sound ritual) and a group homa will also be performed to Rahu on May 9th (IST). You will receive sacred grey ash powder and kum-kum (Red Vermillion Powder), which will be blessed in the rituals. Keep this on your meditation altar and wear it on your forehead during meditation or at other times to expand the divine blessings into your life. Participate in the elite Jupiter Direct in Leo rituals. Dakshinamurthy, a form of Shiva that is a Guru, is the God of education and knowledge who will shower his positive energy on you to achieve success. He is depicted as teaching in silence, transmitting higher knowledge effortlessly to four ancient sages, who were receptive to the inner transference of wisdom. An archana and an individual homa will be performed to Dakshinamurthy on May 9th (IST). 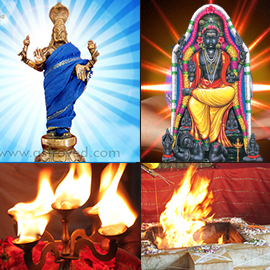 Gain the blessings of Lord Dakshinamurthy through a fire ritual performed with the chanting of Vedic mantras that have the power of transmitting their quantum energies into your life. When you make an individual intention, or sankalpa, to reach out to the celestial powers of the universe and perform fire rituals, you install an imaginary radar-like tracking system for accessing their energies. Make your meditation and focus very powerful by aligning yourself completely with the benevolent energies of the day.